Myth: Leaving the lights on uses less energy than switching them on or off when needed. Busted: The extra charge that is required to start a bulb is very minimal compared to energy consumed while leaving the lights on throughout an entire day. So, continue switching the lights off when you leave a room to save energy! This holds true for other appliances as well. In the past, some appliance manufacturers suggested that customers keep appliances switched on or in standby mode to maintain its life. While this may have been true, modern appliances are designed to be turned on and off regularly, so you need not worry about appliance longevity. 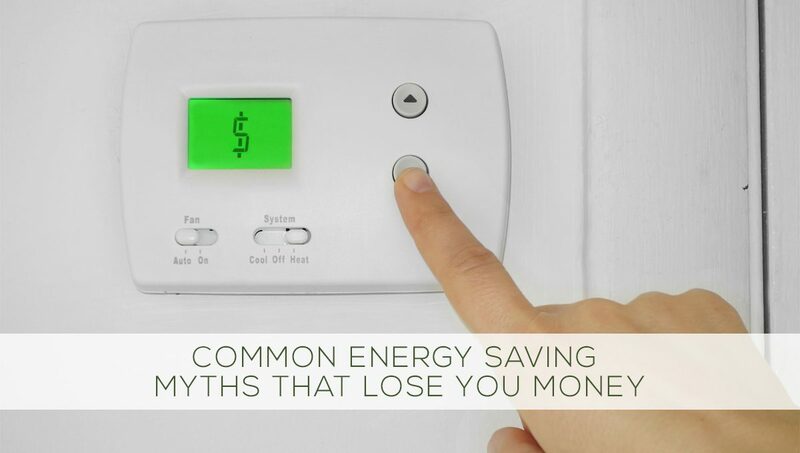 Myth: Closing HVAC vents to unused rooms helps save energy. Busted: This might seem obvious, but the furnaces continue to produce heat regardless of whether every vent is open or not. At the same time, when a vent is closed, it builds pressure in the duct, which can cause an imbalance in the HVAC system. This imbalance can subsequently damage the furnace or create cracks in the ducts that may lead to heat loss. Myth: LEDs are costly and do not fit into traditional sockets as well as conventional bulbs. Busted: LEDs may initially be costly, but it consumes almost 75% less energy than traditional lighting systems. In addition, LEDs have a lifespan of over 20 years, saving you money on replacements and maintenance. Regarding sockets, LEDs come in different forms, shapes, and sizes. They can be used on a dimmer, free-standing lamp, or traditional pendant fixtures. Myth: Leaving fans on will help keep a room cool. Busted: Fans cool people by removing the warm air that surrounds us. Our body cools down when the sweat released from the body is evaporated. Fans aid in this evaporation process and make us feel cool, but they do not cool rooms in the same way. Therefore, a working fan in an empty room is not only consuming energy but also releasing small amounts of heat in the process. Myth: Setting the thermostat higher helps you warm the room faster. Busted: The higher the thermostat is set, the more power it consumes. No matter how high you turn the thermostat, the rate of the heating process of the room takes the same amount of time. This process does not work like pressing the accelerator of a car, like you may intuitively think. Alternatively, you can insulate the room by sealing the windows and closing the doors, which will make your room warm up faster. Myth: Screen savers help save energy when you’re not using your computer. Busted: Screen savers do not save energy. In fact, the highly graphic animations can consume more energy! Screen savers were previously created to prevent the permanent etching of patterns on older monochrome and CRT monitors, and have thus lost their relevance. Next time you step away from your computer, try putting the computer to sleep instead and save energy!